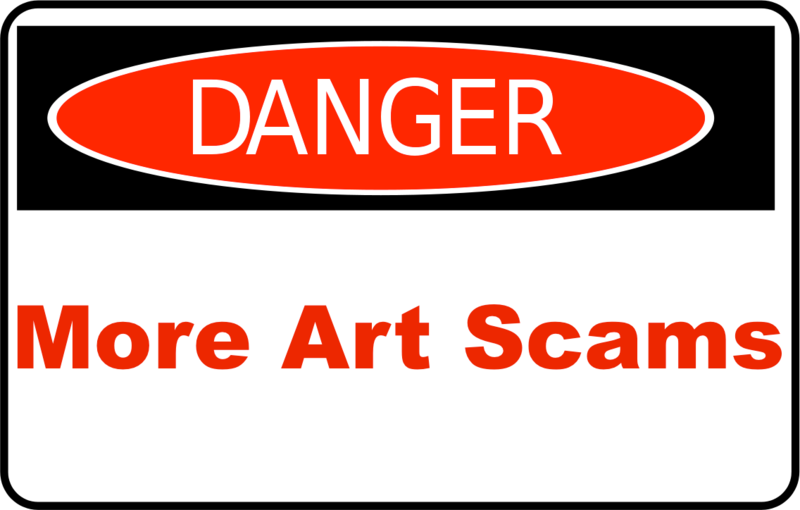 This week, we received another email from ArtSites artist, Jodie Blaney, about a recent art scam she almost fell victim to. An artist will be sent an inquiry about specific art pieces through their art website. The email will look like it's been sent from a local buyer. Next, the supposed buyer will say that they are refurnishing their home and would it be alright if their interior designer (or a local mover) comes by the artist's home when they're in the area to pick up the pieces on their behalf. Next, the buyer couriers a cheque for too much money, typically an over payment of about $1,000. The artist is encouraged to cash (pressured by email) the cheque because the designer needs to pick up the art in the next 2 days. So, if the artist hasn't caught on yet, they end up losing their artwork AND paying a personal cheque to the pick-up person. Finally, Jodie was advised by the Canadian Anti-Fraud Agency to return the cheque to the sender and inform the buyer that the pieces are NOT available. It's important to send by ExpressPost (or registered mail) so that a trace of delivery and proof of return can be made in case of future problems. Many, many thanks, Jodie, for bringing this to our attention and for outlining what you encountered! Your "Red Flag" should be when you see a "good as cash" cheque, that is over-payment for the artwork. The extra amount usually needs to be paid back in some untraceable form to someone untraceable. In all cases we've seen, there were multiple pieces of artwork involved and the scam is helped by the fact that you're usually WOWed by having the chance to sell several items all at once. Don't accept cheques from people you've never met. Do your transactions via PayPal. If the buyer is not willing to do that, then they are likely a scammer. There are some risks in using PayPal, as well, but PayPal does have some of the best fraud protection in the world and they pick up on bad credit cards pretty quickly. Delay delivery of your artwork until you can make sure that a payment cannot be reversed or a cheque has not bounced. Use an Escrow service like Escrow.com, which will make sure the transaction happens. Again, if the buyer is not willing to do this, they are likely a scammer. Do your research whenever someone you DON'T know inquires about buying a piece. It could save you lots of time, money, and artwork!